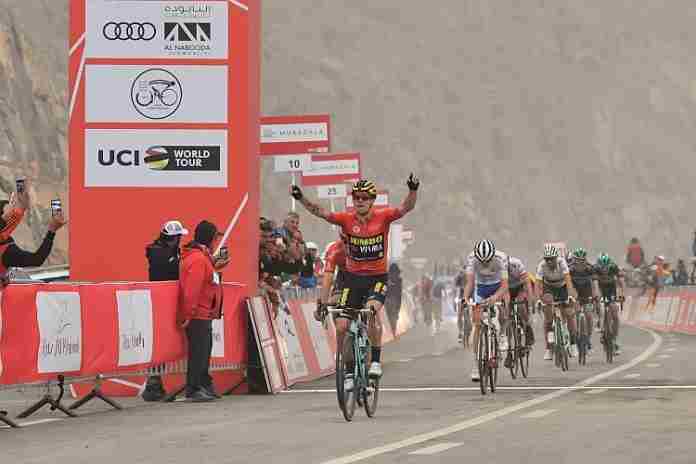 Slovania’s Primoz Roglic has been an emerging star on the UCI World Tour since his first Tour win in 2016 in a Giro d’Italia stage, but he claimed a World Tour multi-stage race win for the second year in a row with a 31-second victory at the UAE Tour. Stage 1 (16 km Team Time Trial): 1. Team Jumbo-Visma (NED), 16:49; 2. Team Subweb (GER), 16:56; 3. Bahrain Merida (BRN), 16:58; 4. Team Sky (GBR), 17:03; 5. Movistar Team (ESP), 17:07. Stage 2 (184 km): 1. Fernando Gaviria (COL), 4:36:32; 2. Elia Viviani (ITA), 4:36:32; 3. Caleb Ewan (AUS), 4:36:32; 4. Kristoffer Halvorsen (NOR), 4:36:32; 5. Erik Baska (SVK), 4:36:32. Also in the top 50: 39. Joey Rosskopf (USA), 4:36:32. Stage 3 (179 km): 1. Alejandro Valverde (ESP), 4:44:50; 2. Primoz Roglic (SLO), 4:44:50; 3. David Gaudu (FRA), 4:44:50; 4. Emanuel Buchmann (GER), 4:44:54; 5. Dan Martin (IRL), 4:45:02. Also in the top 50: 23. Tejay van Garderen (USA), +1:17; … 27. Brent Bookwalter (USA), +1:17; … 43. Larry Warbasse (USA), +2:49. Stage 4 (205 km): 1. Ewan (AUS), 4:27:07; 2. Matteo Moschetti (ITA), 4:27:09; 3. Roglic (SLO), 4:27:09; 4. Quentin Jauregui (FRA), 4:27:12; 5. Luka Mezgec (SLO), 4:27:12. Also in the top 50: 11. Bookwalter (USA), 4:27:12; … 24. Van Garderen (USA), 4:27:12; … 32. Warbasse (USA), 4:27:12. Stage 5 (181 km): 1. Viviani (ITA), 4:48:59; 2. Gaviria (COL), 4:48:59; 3. Marcel Kittel (GER), 4:48:59; 4. Sam Bennett (IRL), 4:48:59; 5. Reinhardt Janse van Rensburg (RSA), 4:48:59. Also in the top 50: 19. Kiel Reijnen (USA), 4:48:59; … 38. Sean Bennett (USA), 4:48:59; … 50. Warbasse (USA), 4:48:59. Stage 6 (180 km): 1. Roglic (SLO), 4:15:39; 2. Tom Dumoulin (NED), 4:15:39; 3. Gaudu (FRA), 4:15:39; 4. Martin (IRL), 4:15:39; 5. 5. Valverde (ESP), 4:15:39. Also in the top 50: 15. Van Garderen (USA), +0:16; … 23. Bookwalter (USA), +0:35; … 27. Rosskopf (USA), +0:58; … 50. Warbasse (USA), +4:54. Final Standings: 1. Primoz Roglic (SLO), 26:27:29; 2. Alejandro Valverde (ESP), +0:31; 3. David Gaudu (FRA), +0:44; 4. Emanuel Buchmann (GER), +0:56; 5. Wilco Keldermann (NED), +1:04; 6. Tom Dumoulin (NED), +1:08; 7. Dan Martin (IRL), +1:11; 8. James Knox (GBR), +1:29; 9. Laurens de Plus (BEL), +1:45; 10. Michal Kwiatkowski (POL), +1:49. Also in the top 50: 16. Tejay van Garderen (USA), +2:22; … 18. Brent Bookwalter (USA), +2:47; … 39. Larry Warbasse (USA), +10:00; 40. Joey Rosskopf (USA), +10:16. The European cycling season started in earnest with the 74th Omloop Het Nieuwsblad Elite from Ghent to Ninove in Belgium. The major break in the race came in the final 40 km of the 200 km course as five riders – two-time winner Greg van Avermaet (BEL), Tim Wellens (BEL), Zdenek Stybar (CZE), Alexey Lutsenko (KAZ) and Dylan Teuns (BEL) – broke away. The winner would be one of the five and while van Avermaet and Wellens tried a late break, the pack re-formed and Stybar’s break with about 3 km left was decisive. Van Avermaet tried to catch up, but fell seven seconds short at the finish. Final standings (200 km): 1. Zdenek Stybar (CZE), 4:53:17; 2. Greg van Avermaet (BEL), 4:53:26; 3. Tim Wellens (BEL), 4:53:26; 4. Alexey Lutsenko (KAZ), 4:53:26; 5. Dylan Teuns (BEL), 4:53:26; 6. Jempy Drucker (LUX), 4:53:26; 7. Yves Lampaert (BEL), 4:53:26; 8. Philippe Gilbert (BEL), 4:53:26; 9. Matteo Trentin (ITA), 4:53:26; 10. Oliver Naesen (BEL), 4:53:26.